Journal of Nanjing Agricultural University, 2019, 42(2): 328-335. 武鸿, 康亚男, 唐荣宏, 等. 3株樱桃谷肉鸭源和2株番鸭源新型鸭呼肠孤病毒的分离与鉴定[J]. 南京农业大学学报, 2019, 42(2): 328-335. 通信作者：鲍恩东, 教授, 博导, 主要从事兽医病理学研究, E-mail:b_endong@njau.edu.cn. Abstract: [Objectives] The paper aims to isolate and identify duck reovirus from the dead ducks with clinical manifestations characterized by necrosis of liver and spleen. [Methods] The virus was isolated and propagated by inoculation of 10 days old duck embryos and further molecular biology identification was operated with PCR detection and the analysis of σC gene sequence. 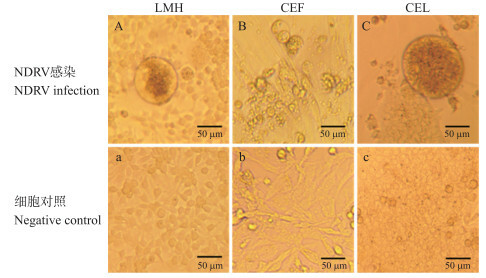 The detection of the biological characteristics included the infection of Leghorn male chicken hepatocellular carcinoma(LMH), chicken embryo fibroblast(CEF) and chicken embryo liver cell(CEL), the chorioallantoic membrane inoculation of 11 days old Cherry Valley duck embryos, and leg muscle injection of 4 days old Cherry Valley ducks. The physicochemical characteristics were determined by the detection of the sensitivity of the isolated NDRV to chloroform and trypsin. [Results] 5 novel duck reoviruses(NDRV) were identified, RPVA1311, RPVA1312, RPVA1313, RPVA1314 and RPVA1315, respectively. Compared with novel duck reovirus, avian reovirus(ARV) and Muscovy duck reovirus(MDRV), the nucleotide homology of σC gene sequence of the isolated NDRV were 94%-98%, 38%-41% and 40%-50%, respectively. The isolated NDRV could proliferate in LMH, CEF and CEL, and induce cytopathy characterized by cell fusion and the formation of syncytium, and the LMH viral titers of two virus isolated from Muscovy ducks(lg[TCID50]:6.32, 6.63) were significantly higher than those of three virus isolated from Cherry Valley ducks(5.83, 5.68, 5.63).All of 11 days old Cherry Valley duck embryo inoculated with the isolated NDRV died, and the main lesion of dead embryo was systemic bleeding points and ELD50 was titrated to be higher than 105.0. The virus titers of the duck embryos infected with the virus isolated from Muscovy ducks(lg[ELD50]:5.50, 5.63) were a little higher than those of the duck embryos infected with the virus isolated from Cherry Valley ducks(5.32, 5.12, 5.00). The study also found that 4 days old ducks injected with the isolated NDRV were able to show the same symptoms as the natural DRV cases, and the morbidity was 100%. Besides, the identical viruses could be isolated again from the livers and spleens of dead ducks. As for necropsy, spleen was obviously swelling with necrotic spots. In the histopathological examination, necrosis and notable lymphocyte decrease in spleen, and hepatocyte degeneration and infiltration of inflammatory cells around the portal area in the liver were observed. The tests of physicochemical characteristics indicated that the isolated NDRV strains were insensitive to chloroform and sensitive to trypsin of various degree. [Conclusions] The five isolated virus are a new-type duck reovirus of Reoviridae Orthoreovirus. 图 1 NDRV分离毒株σC基因扩增图 Fig. 1 Amplification of σC gene of the isolated NDRV M. DNA分子量标准品; 1~5. RPVA1311~RPVA1315毒株; 6.阴性对照株; 7.阳性对照株。 M. DNA molecular weight standard; 1-5. RPVA1311-RPVA1315 strain; 6. Negative strain; 7. Positive strain. 图 4 NDRV分离毒株感染鸭胚病变 Fig. 4 Lesion of duck embryo infected with the isolated NDRV 1. RPVA1311毒株:全身弥漫性出血; 2. RPVA1312毒株:背部斑块状出血; 3. RPVA1313毒株:全身弥漫性出血; 4. RPVA1314毒株:全身点状出血; 5. RPVA1315毒株:全身弥漫性出血; 6.内脏肿胀, 有出血点。 1. RPVA1311 strain, diffuse systemic hemorrhage; 2. RPVA1312 strain, plaque-like hemorrhage; 3. RPVA1313 strain, diffuse systemic hemorrhage; 4. RPVA1314 strain, generally dot-like hemorrhage; 5. RPVA1315 strain, diffuse systemic hemorrhage; 6.Visceral swelling and bleeding points. 肝脏:a1.感染后2 d, 肿大、边缘钝圆、呈土黄色; b1.感染后7 d, 病变逐渐恢复; c1.感染后14 d, 无明显病变。a2、b2、c2:对照组2、7、14 d。 Spleen:A1. 2 d after infection, swelling, deep red; B1. 7 d after infection, partial congestion, dark black; C1. 14 d after infection, white necrotic lesions, surrounding hemorrhage, a clear boundary between necrosis and healthy tissue. A2, B2, C2. Control group 2, 7, 14 d spleen. Liver:a1. 2 d after infection, swelling, blunt edges, yellowish; b1. 7 d after infection, gradual recovery; c1. 14 d after infection, inconspicuous lesion. a2, b2, c2. Control group 2, 7, 14 d liver. 图 7 NDRV分离毒株感染雏鸭病理组织学病变(HE染色) Fig. 7 Histopathological examination of ducklings infected with the isolated NDRV by HE staining A1. 脾脏:脾窦淤血, 淋巴细胞减少, 脾中分布坏死灶, 中心为坏死的淋巴细胞以及网状细胞, 周围嗜中性粒细胞浸润, 结缔组织增生; A2.脾脏对照; B1.肝脏:肝索紊乱、断裂, 肝细胞脂肪变性、水泡变性, 淋巴细胞在汇管区周围浸润; B2.肝脏对照。 A1. Spleen:congestion in spleen sinuses, lymphocytes decrease, necrotic foci in the spleen, necrotic lymphocytes and reticular cells in the center, peripheral neutrophil infiltration, hyperplasia of the connective tissue; A2. Spleen control; B1. Liver:hepatic cord disorder, rupture, hepatocyte steatosis, vacuolar degeneration, lymphocyte infiltration around the portal area; B2. Liver control. 胡奇林, 陈少莺, 江斌, 等. 一种新的番鸭疫病(暂名番鸭肝白点病)病原的发现[J]. 福建畜牧兽医, 2000, 22(6): 1-3. Hu Q L, Chen S Y, Jiang B, et al. Discovery of the pathogen of Muscovy duck liver white spots disease[J]. Fujian Animal Husbandry and Veterinarian, 2000, 22(6): 1-3 (in Chinese with English abstract). 吴宝成, 陈家祥, 姚金水, 等. 番鸭呼肠孤病毒的分离与鉴定[J]. 福建农业大学学报, 2001, 30(2): 227-230. Wu B C, Chen J X, Yao J S, et al. Isolation and identification of Muscovy duck reovirus[J]. Journal of Fujian Agricultural University, 2001, 30(2): 227-230 (in Chinese with English abstract). 黄瑜, 程龙飞, 李文杨, 等. 雏半番鸭呼肠孤病毒的分离与鉴定[J]. 中国兽医学报, 2004, 24(1): 14-15. Liu H.Isolation and identification of Pekin duck reovirus[C]//Chinese Association of Animal and Veterinary Science.Poultry Health Branch of China Animal and Veterinary Science Conference on 16th.Beijing, 2012: 191-193(in Chinese). Liu Q F, Zhang G Z, Yu H, et al. Isolation and characterization of a reovirus causing spleen necrosis in Pekin ducklings[J]. Veterinary Microbiology, 2010, 148(2): 200-206. 陈宗艳, 朱英奇, 王世传, 等. 一株新型鸭源呼肠孤病毒(TH11株)的分离与鉴定[J]. 中国动物传染病学报, 2012, 20(1): 10-15. Ning K.Duck reovirus molecular epidemiology research[C]//Poultry Epidemiology Branch of China Animal Husbandry and Veterinary Institute.The Third Annual Waterfowl Conference on Disease Prevention and Control.Chengdu, 2015: 82(in Chinese). 殷震, 刘景华. 动物病毒学[M]. 2版. 北京: 科学出版社, 1997: 204-542. Yin Z, Liu J H. Animal Virology[M]. 2nd ed. Beijing: Science Press, 1997: 204-542 (in Chinese). 黄瑜, 苏敬良, 施少华, 等. 我国鸭呼肠孤病毒感染相关的疫病[J]. 中国兽药杂志, 2009, 45(7): 57-58. 陈海鹏, 云涛, 张存, 等. 新型番鸭呼肠孤病毒σC蛋白的原核表达及其抗原特[J]. 浙江农业学报, 2014, 26(6): 1448-1452. Zheng X J.Comparison of biological characteristics of two Pekin duck-origin reoviruses[D].Beijing: China Agricultural University, 2016: 16-19(in Chinese with English abstract). 胡奇林, 陈少莺, 林锋强, 等. 番鸭呼肠孤病毒的鉴定[J]. 病毒学报, 2004, 20(3): 242-248. 祁保民, 陈晓燕, 吴宝成, 等. 番鸭呼肠孤病毒诱导的细胞凋亡观察[J]. 畜牧兽医学报, 2010, 41(4): 495-499. Qi B M, Chen X Y, Wu B C, et al. The observation of the apoptosis induced by Muscovy duck reovirus[J]. Chinese Journal of Animal and Veterinary Sciences, 2010, 41(4): 495-499 (in Chinese with English abstract). 刘伟, 崔国杰, 陈少莺. 新型鸭呼肠孤病毒和鸭肝炎病毒混合感染的诊断及病原分离[J]. 畜牧与兽医, 2014, 46(5): 92-95. Liu W, Cui G J, Chen S Y. Diagnosis and pathogen isolation of the mixed infection of novel duck reovirus and duck hepatitis virus[J]. Animal Husbandry and Veterinary Medicine, 2014, 46(5): 92-95 (in Chinese with English abstract). 陈少莺, 陈仕龙, 林锋强, 等. 新型鸭呼肠孤病毒的分离与鉴定[J]. 病毒学报, 2012, 28(3): 224-230. Chen S Y, Chen S L, Lin F Q, et al. The isolation and identification of novel duck reovirus[J]. Chinese Journal of Vriology, 2012, 28(3): 224-230 (in Chinese with English abstract). 陈峰, 雷雯, 张祥斌, 等. 免疫鸭群中一株变异型番鸭呼肠孤病毒的分离与特性研究[J]. 中国预防兽医学报, 2013, 35(8): 618-622.